The NZMuseums Web site provides a focal point for all museums in New Zealand. A major redevelopment of the site set out to provide a strong presence on the Internet for several hundred small mainly voluntary museums. Challenges included developing a process for museums with only basic knowledge of technology to contribute, generating momentum in the sector for the project, data quality issues, and a long list of desirable functionality. The redeveloped Web site was launched on 17 September 2008. Every museum has its own profile page on the Web site and each can catalogue highlights of the collection for a global audience. The new Web site is the result of a collaboration between National Services Te Paerangi at the Museum of New Zealand Te Papa Tongarewa and Vernon Systems Ltd, the solution provider for NZMuseums and creator of eHive, the underlying CMS. Many of New Zealand’s thirty-five major metropolitan and regional cultural institutions (approximately 15% of New Zealand’s museums) have well developed Web sites, but most of the country’s museums (approximately 85%) are small and mainly volunteer run, and do not have the resources to set up a custom Web site. National Services Te Paerangi, a division of the Museum of New Zealand Te Papa Tongarewa (Te Papa), commenced a project in 2006 (first proposed in 2003) to redevelop the existing NZMuseums Web site (http://www.nzmuseums.co.nz) to provide better access to all of New Zealand’s heritage collections. For the initial launch, 50 museums had catalogued collection items, 90% of which were not previously available on the Web. The Web site also includes 'what's on' at museums, can be used as an on-line collection management system (CMS), and acts as a directory for finding museums throughout the country. What needs to be in place for small museums to successfully contribute to a national collections Web site? How can a portal for many museums be built with limited resources? What features would encourage re-use of the data for other projects? When the Web site was first proposed in 2003, the main goals were to make the existing on-line museum directory (which was by then more than six years old and suffering from a very tired design and lack of functionality) more dynamic, interactive and visually appealing; to provide small museums with the tools to document un-catalogued collections; to provide all museums with methods to contribute collection information to the Web site; and in general to provide a more engaging, interactive Web site from which the public could access collection information. The redevelopment would provide a focal point for all museums in New Zealand and would allow the hundreds of small museums to have a stronger supported presence on the Web; with the later advent of Web 2.0, it would also allow the end-user to communicate with the museums through comments and tagging, not featured as a potential benefit from the start. Challenges that existed included selling the concept to potential contributors; developing a process for museums with only basic knowledge of technology to provide content; supporting multiple existing collections management systems; training the participants; addressing data quality issues; and prioritising a long list of desirable functionality. It was also an imperative to consider what was necessary to give the Web site a strong foundation for the future. The redeveloped Web site for New Zealand’s 400 + museums was launched on 17 September 2008. Every museum has its own profile page on the Web site and each now can catalogue its collection for a global audience. After more than 10 months of active marketing to the sector, and the provision of several relevant training options, 50 museums had catalogued collection items ready for the launch: 90% of this content was not previously available on the Web. the future plans for the site. The new Web site is the result of a collaboration between National Services Te Paerangi (NSTP) and Vernon Systems Ltd (VSL), the solution provider for the project. National Services Te Paerangi (NSTP) is a division of the Museum of New Zealand Te Papa Tongarewa. NSTP exists because of the Te Papa Act 1992 which states in Section 7 (i) that a function of the museum is “To co-operate with and assist other New Zealand museums in establishing a national service, and in providing appropriate support to other institutions and organisations holding objects or collections of national importance”. The aim of the national service has been to build the capacity of the museum sector and to keep museums sustainable. Since 2006 the NSTP mission has been: “To strengthen the museum sector by providing practical and strategic help to museums and iwi throughout Aotearoa New Zealand”. This is accomplished through the delivery of training programmes, the New Zealand Museums Standards Scheme of best practice, strategic leadership, support, advice, on-site assistance for museum personnel, a programme of grants, internships, and development of a range of resources for the sector, including the Web site NZMuseums. In 2003, the then-Director of NSTP presented at the National Digital Forum (NDF) Conference (a yearly New Zealand based conference focusing on digitisation issues and projects in the Libraries, Archives and Museums sector of New Zealand, with some international contributions) a proposal for the redevelopment of the NZMuseums Web site. This proposal was based upon recommendations summarised in a report commissioned by NSTP titled “Museums Online: Finding Museums Everywhere” (2002). In that report, a survey commissioned in 2000 was summarised, having identified that “few museums have their resources in a state that they could contribute to an on-line collections database…large numbers are without their collections in digital formats” (Kenderdine, 2000). 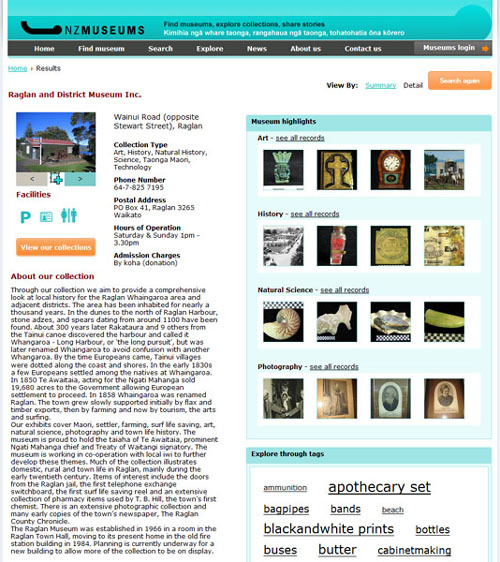 The concept proposed was for a re-designed version of what was at that time referred to as NZMoL – New Zealand Museums On Line, which was first developed in 1997/98 and which had been redeveloped in 2001 into a basic Web site that featured some enhanced search capabilities and enabled museums to update their own content; but it was still a very basic directory of New Zealand museums with a narrow range of information available about each individual museum. 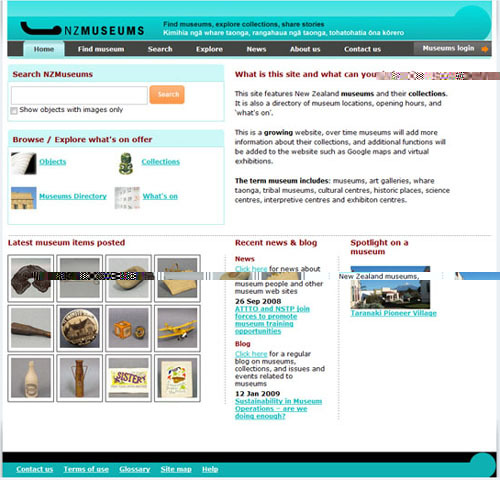 The aim by 2003 was to feature the collections of the museums of New Zealand on the site, in line with the work being carried out by other Web-based initiatives, such as Canada’s CHIN, Scotland’s SCRAN and Australia’s CAN collection-based Web sites. Rather than just a short introductory paragraph, the hours of opening, and icons denoting types of collections held (plus a link to the museum’s Web site if one existed), more would eventually be offered to a global audience on NZMuseums. At the time of the presentation on the re-development concept at the NDF Conference in 2003, two further surveys had been completed. In 2002, a survey of the sector (Revero Web Specialists, 2002) revealed that museums with no digital collection management system (CMS) represented approximately 85% of the sector; museums with a digital CMS that does not publish digital content to a Web site represented approximately 15% of the sector; and museums with a CMS that published digital content to a Web site represented less than 1% of the sector. This survey also highlighted that over one-third of respondents had neither a Web site nor on-site Internet access. By 2004, more museums had added their new Web site links to NZMuseums, but those numbers remained in the minority. In 2003, NSTP commissioned a report (Revero Web Specialists, 2003) to examine the potential of expanding the Web site to include the hosting of information on collections, recognising the barriers for museums to utilise the Internet without seeding, or central, support. NSTP also sought feedback from the sector in terms of its relevance and priority for museums. Of twenty-six responses received, a total of 77% indicated that the further development of the NZMuseums Web site should be accorded a medium or high priority for investment by NSTP and the sector. A total of 85% of respondents indicated that they would like to add either a selection or all the items held in their collections databases to the site. A total of 46% of respondents indicated that they anticipated being able to add material to the site within the next three years. Although a small percentage of responses was received in 2003, over the next two years, through the face to face out-reach work of NSTP throughout the country, as well as presentations on the subject at several museum conferences, it became clear that personnel working in the voluntary and small museum portion of the museum sector were eager to be involved, but still openly expressed a lack of comprehension of what could be done and lack of knowledge of how to be involved in such a project, with little comprehension of exactly what this project would mean for them in the long term. However, once they learned more about the proposal, most were eager to somehow be involved, with support from NSTP. What Defines A Small Museum In New Zealand? Several benchmarks could be used, including staff levels, the proportion of volunteers to paid staff, and annual budgets, to indicate what a small museum is in New Zealand. The New Zealand Tourism Research Institute (NZTRI) at the Auckland University of Technology conducted a Web survey of museum staffing and funding (NZTRI, 2008). Of the 426 New Zealand museums invited to participate, 123 returned information on staffing levels. 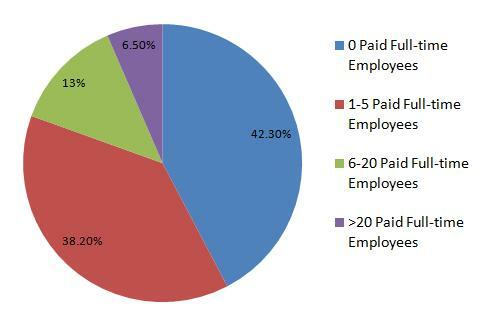 Of these, 80% had five or fewer full-time employees. With so many of the potential contributors to NZMuseums being small museums, it was important to identify problems facing them for the project. The NZMuseums solution provider (which was co-incidentally beginning work on a similar concept before answering the NSTP RFP) organised independent focus groups in February 2006 in three regions of the country. These were attended by representatives of 15 small to medium museums, as well as people working in the museum service industry. Each focus group took part in three hours of discussions. Most of the museums depended upon volunteers, with nine institutions having more volunteers than paid staff. “When you’ve got volunteers working for you, they will change, so there is always someone new coming in … in a small museum it has to be easy otherwise a) they [the volunteers] get daunted … b) they change” (focus group attendee). The time and resources likely to be needed to undertake data entry and digitisation projects were a key concern. Small museums had little or no IT infrastructure and did not usually have the expertise to buy and maintain their own PCs. Support and training for the project was essential to small museums. Many of the smaller museums are located in remote areas of New Zealand. While the Government has been investing in Internet access, there are still many areas where connection is limited to dial-up. Many had reservations over providing public access to their collections on the Internet. Fears included possible copyright infringement, a reduction in physical visitor numbers, an increased risk of theft by the public as the holdings of the museum became more visible, and inappropriate comments or tags being added to records. “We still want them to come to the museum. We don’t just want them to sit at home and look at it on their screen” (focus group attendee). What Did The Museums Ask For? As an outcome of the surveys, focus work and discussions with the sector, it was clear that museums wanted a site that would be simple, easy to contribute to - and one that did not require too much staff training. They were looking for training and ongoing support from NSTP regardless of the chosen solution. They also expected that the Web site would cater for key object information - what it is, where it is, where it came from (provenance, acquisition, field collection), and that any costs would be kept down, if the solution was not going to be completely free. support the centralised coordination of approach, implementation, support and training through National Services Te Paerangi without losing the individuality of each museum’s unique collection. new opportunities to incorporate material into arts education – nationally and internationally. reduction of the likelihood of disparate solutions being adopted by individual museums, thereby potentially reducing the opportunities for on-line collaboration. As noted in the section of benefits listed above, one benefit identified by this redevelopment was the opportunity for museums (small museums in particular) to participate in New Zealand’s wider sector and national level initiatives. use the DigitalNZ API to access digital content to use in their own work. DigitalNZ grew out of the Digital Content Strategy (2007). It is designed to contribute directly to meeting the challenges identified in the areas of access and discovery, sharing and using, and managing and preserving digital content. (http://www.digitalnz.org/). Initially, once the project gained momentum in 2006/07, a pilot phase was considered, and museums were sought to take part. However, due to the length of time required to train and ready the sector and to produce the solution, (Vernon Systems Ltd (VSL), the solution provider, came on board in the first half of 2007), the pilot phase was waived in favour of concentrating on training and upskilling the sector across the board, to ready as many museums as possible for the launch in 2008. What Do Small Museums Need In Order To Contribute to a National Web site? From the beginning of 2006 onwards, NSTP maintained a concerted effort to promote the Web site re-development to the sector. At the Museums Aotearoa (MA) (the membership organisation for museums in New Zealand) Conference in early 2006 and 2008, presentations were given on the project, and in 2008 a short presentation on photography for the Web was provided after the presentation. The re-development was also presented on at the NDF Conference in 2006 and 2007, and finally as a completed product in 2008. Regular e-alerts and e-newsletters were sent to the sector from NSTP as promotional tools for the redevelopment, as well as regular updates and information outlining the steps that should be taken to prepare material for the Web. The solution providers, Vernon Systems Ltd, were contracted to the project by mid 2007, and previously in late 2006 NSTP had employed new staff to work in the field as Museum Development Officers (MDO). During 2007 and into 2008, the main task of the MDOs was to promote the concept of the re-development of NZMuseums to the smaller museums sector in particular, and to ensure that this sector was preparing objects and associated information for the future site. Thus, from the end of 2006 onwards, the new NSTP positions of Museum Development Officer were promoting the redevelopment to museums throughout the country, face-to-face, and encouraging the initial preparation of a minimum of 20 items for placement on the site. Many museums did not understand exactly what to do, or what they were doing it for, until they were shown screen-shots of mock-ups of the future site; these helped them to understand the concept, particularly how their images would be placed on-line and the associated information that should be provided. In line with the observation that the sector did not have full comprehension of the project and how to take part in it, an on-line forum was established by VSL in early 2008. This provided a simple way for the solution providers to answer the more technical questions coming from the sector, most of which could not be answered by NSTP staff who only had the conceptual know-how rather than the technical know-how (http://forum.ehive.com). It was recognised very early on that there were several real barriers to involvement of the sector in the project. First, many small museums still did not have the knowledge required to confidently and correctly document their collection; thus many were attempting simply to number items for the Web site project. Clearly there was still considerable need for training on collection documentation. Therefore a nationwide programme of workshops on collection documentation, presented by collection managers from regional museums for the sector, was provided by NSTP. The second barrier to involvement was the perceived difficulty and lack of technical know-how required to photograph or scan museum collections for the Web. In order to manage this issue, NSTP staff first engaged in the relevant training themselves, arranging for and attending workshops on Digitisation, Scanning for the Web and Photography for the Web. Following closely, workshops on Collection Documentation, Digitisation, and Photography for the Web were provided for the sector throughout the country, to ensure skills and confidence rose while personnel were preparing collections for the new Web site. All training was provided regionally to groups of personnel from small museums in a geographical region. Discussions and vocalisation of concerns were encouraged at these regional groups, so that museums would work together on preparing material to go on-line and simultaneously share issues and ideas. During this time, in the lead-up to the site launch, museums had a deadline to prepare their material for the site. A manual uploading tool, in the form of a collection documentation spreadsheet, was created by the solution provider, and tested first by a small group of small museums’ personnel. This was necessary initially because the on-line tool, eHive, was being built alongside the new NZMuseums site, and would not be ready in time to upload items to NZMuseums by its launch date in September 2008, (eHive, the on-line tool, was finally launched in December, 2008). Another major factor that had to be considered was the need to keep costs for involvement to a minimum, especially in light of the lack of financial resources available to the small museum sector. However, due to the nature of the arrangement between NSTP and VSL, which was that this project would be developed and then managed by a commercial provider rather than Te Papa staff, there was a requirement to cover costs incurred for administration and storage of data by VSL. VSL came up with various competitive pricing options, which still allowed for a free option for those who wished to hold a minimum amount of information on-line (200 items) and not pay to use it as a full CMS. Various pricings were made available for numbers of collection items, and as an incentive, NSTP initially offered a grant to cover a free first year of licensing for any small mainly voluntary museum to put up to 1000 items on-line. Since launching, storage costs have dropped, thus allowing for the license to now cover storage of up to 2000 images. To date, there has been slow uptake of this offer, and many museums have chosen the free, up to 200 images, option. VSL worked with a local Web site development company to finalise the overall structure for the site. Initial wireframes were laid out with the proposed sections. National Services Te Paerangi then conducted paper-based user testing on the wireframes with a small group of testers representing the age groups and backgrounds of potential users of the Web site: high school children, museum professionals and casual visitors, including the elderly. The key areas of the site are listed below. Contact us – contact information, including a free phone number to National Services Te Paerangi for assistance with the project. Each museum has its own profile page with a random sample of images of the collection and the museum. The object detail page gives the option for users to add tags or comments. Each contributor has a personal account in the eHive collections management system through which to assess all personal content, which may include records not published, and additional fields of private information the public cannot see, such as valuations and acquisition details. Users access their accounts via a secure login. Each museum can catalogue any number of objects, each of which can have one or more images linked to it. Images are resized into several smaller derivative sizes for use on the Web. NZMuseums exists as a community within eHive. Museums that have been approved to join the community (specifically, museums within New Zealand) are allowed to mark any number of object records as being part of the NZMuseums community. For NZMuseums members, their public objects are marked by default as also being part of the NZMuseums community, but they are able to change this default or remove any single object from just NZMuseums. Each object record additionally has a flag to indicate if it is publicly viewable. NSTP saw two advantages of having NZMuseums as a community within eHive. There were economies of scale with the solution as the cost was spread outside of New Zealand, and contributors had additional exposure for their collections through the eHive Web site. 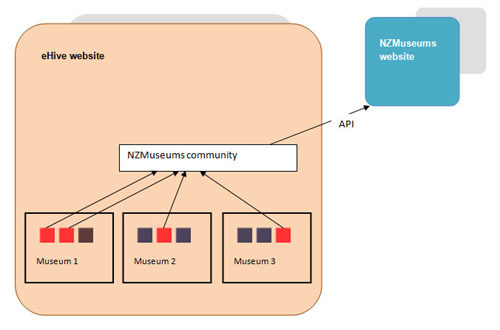 The NZMuseums Web site has its own branding and connects to eHive using an application programmable interface (API). The museums that belong to the community then appear in the Find museum directory of the NZMuseums Web site. Objects that are marked as being in the NZMuseums community are available within the Search and Explore sections of the NZMuseums Web site. The project is built on well established affordable technology, including the LAMP solution stack (Linux operating system, Apache Web Server, MySQL database, PHP Web pages) (http://en.wikipedia.org/wiki/LAMP_(software_bundle)) and Apache Lucene text indexing (http://lucene.apache.org/java/docs/). When images are uploaded by the contributors, the Image Magick toolkit (http://www.imagemagick.org/script/index.php) is used to create several sizes of original image in JPEG format for Web use. The NZMuseums Web site is built on top of the Joomla content management system (http://www.joomla.org/). This provides National Services Te Paerangi with on-line tools to add news articles and edit predominantly static areas of the site, such as About us and Contact us. Vernon Systems is responsible for the technical administration of the NZMuseums Web site. This is hosted on two identical servers for load balancing and redundancy. These servers reside in the United States as the costs for hosting in New Zealand are currently significantly higher than in the USA. There were several standards considered important for this project: the New Zealand Museums Standards Scheme, Spectrum museum data standard, Dublin Core metadata standard, and OAI-PHM data harvesting protocol. The New Zealand Museums Standards Scheme involves a self review and peer review. All museums that want to improve their practice as caretakers of New Zealand’s heritage are encouraged to participate in this voluntary scheme. It is founded on research into overseas standards schemes and consultation with the New Zealand museum sector. One of the aims of the Standards Scheme is to encourage all New Zealand museums to achieve accepted standards in managing their collections (Museum of New Zealand Te Papa Tongarewa, 2007). For the NZMuseums project, we looked at what cataloguing data could be captured to assist museums with meeting the standards described in the scheme, particularly the Care of Collections and Taonga module. The UK Collections Trust standard for collections management, Spectrum, was also consulted before we finalised the list of cataloguing fields (http://www.mda.org.uk/stand). We also needed to assess how the NZMuseums Web site would fit in with the portal site for New Zealand libraries, archives and museums – Matapihi (http://www.matapihi.org.nz). Matapihi currently has images from the collections of 17 larger New Zealand institutions. The contribution process works by sending the administrators, National Digital Library, an XML file with records in Dublin Core metadata format. Images for the site only exist on the contributing institution’s own Web server, with the Matapihi search result pages serving the image content from the external Web servers of the many contributors. NZMuseums provides an opportunity for smaller museums to be part of Matapihi as they now have images on a live Web site. VSL is now developing the remaining requirement to support Matapihi: the export from NZMuseums of selected content to Dublin Core based XML. In the cataloguing screens the Dublin Core Type field was set to be required so that all cataloguing records have the correct resource type indicated (e.g. still image, physical object, text, moving image). There are also digital projects in New Zealand which rely on the Open Archives Initiative Protocol for Metadata Harvesting. This protocol allows for the periodic harvesting of data for use in another application or Web site. Support for this was not included in the first phase of the NZMuseums project but has been scheduled for later in 2009. The National Services Te Paerangi section of the Te Papa Web site was used to log progress and store documents available to contributors. The bi-monthly National Services e-mail based newsletter goes to most museums in the country and includes information about training, project progress and related events. A wiki-based Help site and a support forum were established to streamline answering help questions. What content would be in the site at the launch date? Was it acceptable to have no content at launch, but then to encourage contributors to use the new on-line tools? It was decided that it was essential to get as much content as possible collected for the Web site ready for the launch date, and VSL needed to find a way to do this. With development of the on-line tools only just beginning, it was necessary to find an interim approach. VSL had to support multiple original data sources, including paper catalogue cards, spreadsheets and existing collections management systems from several different vendors. They settled on using an Excel spreadsheet specific to the project’s needs. This provided a stepping stone between the existing systems and the project’s collection management system; it provided a way for sites without existing electronic data to catalogue their records. The spreadsheet performed basic validation and supported a relational structure with acquisition source, maker, storage location and place information split into separate sheets. Dropdown fields ensured consistent content for fields such as Dublin Core Resource Type, and the separate sheet for person information was used to format person names in a consistent way. Images were referenced by folder path and filename. Help and example records were included in the spreadsheet, and a short document was supplied with the spreadsheet outlining how it worked and giving advice on the organisation of image files. Completed spreadsheets with images were sent to the project team for import into the developing system. A Visual Basic function generated an XML file containing all of the data in each spreadsheet. A function for the Web site was built that imported the XML data and automatically created image derivatives (copies) in several standardised smaller formats for use in various sections of the Web site. Some of the museums with existing systems exported data into spreadsheet format and then cut and pasted columns from their spreadsheet into the project spreadsheet, with a project spreadsheet providing a stepping stone between the original CMS data structure and the NZMuseums data structure. The process worked well, but most of the contributors needed some advice along the way. In hindsight, this could have been streamlined with earlier introduction of a Web-based wiki or forum as the focal point for answering questions about what to do. Once the Web site launched, data entry directly into the collection management system became an alternative method for getting content in. Museums can create pick lists based on their own terminology. VSL also negotiated rights to include the Taonga Māori Thesaurus as a built-in classification system. This is widely used in New Zealand for classifying Māori treasures and supports the use of Te Reo Māori (the Māori language) in classifications. Several of the contributors had reservations about opening up their data for the public to add tags and comments. The use of public tagging at the Powerhouse Museum in Sydney to aid content discovery (Chan, 2008) helped to provide a precedent that contributors could relate to. We added an option for contributors to disable public tagging and comments on their own records, but so far all contributors have kept these options enabled. Image theft was also a concern. Contributors are able to watermark images prior to sending them to the project team. Public access was also limited to only the derivates used on the Web pages and not to the original images. We are investigating using Creative Commons as a way of providing a set of standard rights that contributors can assign to individual records to make it clearer how subsets of content can be re-used. Another fear was that putting content on-line would either reduce physical visitor numbers or result in a quantity of enquiries that could not be dealt with. The counter argument was that the on-line presence provided a way to engage a wider, more diverse audience, including those for whom a physical visit would be impossible. The site helps to make the collection more accessible to researchers and acts as an advertisement for the institution through the media of the Web. The Web site also provides a place for each museum to more publicly state what its policy is on loans and enquiries, and it encourages the museums to build better processes and policies around these. For some of the museums, this project provided the incentive to catalogue a part of their collection for the first time. To assist with this, as previously stated, National Services Te Paerangi provides a programme of digitisation and photography workshops, and this programme was initiated as part of this project. Contributors felt they want to get things right and provide actual and full detail about the objects they were cataloguing. Some undertook considerable research during the cataloguing project. They were asked for a minimum of 20 items per contributing museum, and this apparently small request provided quite a challenge for some. Many of the smaller voluntary museums are still without computers or a fast Internet connection, if they have an Internet connection at all. To help reach more of these museums we have plans to print paper-based forms to match the data entry screens. These could then be entered at a regional hub meeting. The South Otago region in the South Island includes many museums without Internet connections, and a group of these museums is helping with the development of the paper-based forms. VSL is also considering an off-line module (a database-driven replacement to the original spreadsheet) that would allow contributors to do basic cataloguing off-line, maintain their own local repository for their collection records, and then periodically upload this to the Web-based collections management system. Raglan Museum and Taranaki Aviation Transport and Technology Museum (TATATM), both in the North Island of New Zealand, are typical examples of many of the contributors to the site. The Raglan Museum is a small museum which holds the collections of a small seaside town in the Waikato area of New Zealand. Staffed by volunteers and 1 part-time employee on project work, the museum is only open to the public for a few hours over the weekends. The history of this area is vast and spans from early Maori civilization through to Missionary and Settler activity from the 1830’s and beyond. You can read more about this history on our NZMuseums homepage. [The project] tied in with our current objective of digitising and cataloguing all of our artefacts into museum software PastPerfect 4.0. In theory, it was going to be easy as pie. In reality, it proved to be a bit of a nightmare, as I was only just getting started on our digitising journey and we simply didn’t have the information needed to complete the excel spreadsheet fields which were required. I found myself wishing Te Papa had announced this new Web site in a years’ time, and by then I would have researched the artefacts and would be ready to roll with the project. On the other hand, by using the NZMuseums Web site as motivation, we narrowed our selection down to 100 artefacts, took the digital photographs, and researched what we could in the time available. It was difficult to foresee how the information would look on-line, but thanks to the patience and guidance of the people of the project team we were able to complete the project within the deadline. Overall we have found the NZMuseums Web site to be very useful, and a great way to display our collections to a much wider audience. Local people have shown more interest since having seen their museum on the Internet, and tourists are able to access it ahead of their stay in our seaside town. Researchers interested in topics specific to our area also find it useful. I particularly like the interactive nature of it as I have had people query the objects, and this can lead to a deeper understanding of an artefact, or a recognition of its worth, or an ancestral connection. Now, over time, we will be able to add further artefacts, and this will more completely tell the stories of Raglan/Whaingaroa area and its people. When I first heard about the NZMuseums proposed Web site my immediate reaction was, the existing museum records are not sufficiently accurate, what information does the museum have that would be useful on such a Web site and how can suitable photographs be provided? I missed an earlier seminar about digitisation so almost gave the idea away. I admit that it was only regular emails from NSTP that prompted me to enthuse other members that TATATM should make some attempt to be one of the museums with some information for the launch of the proposed Web site. NSTP asked for a minimum of 20 items so we stuck with that number. Obstacles for TATATM included building a white hardboard backdrop for photographing objects and creating an object numbering system as no existing system was in use. It is easy to take a photograph but then to add the other information is the time consuming part. The first few items chosen were unique to TATATM, designed and manufactured locally. These ‘ice breakers’ whetted the appetite and research and / or stories about each item gained momentum. The learning curve was more vertical than steep. Those involved with the research are justly proud of the achievement. It is not easy to measure the success of being included in such a Web site; there is no ‘yardstick’ to compare with. The museum has, since the Web site launch, had an increase in visitor numbers. This could be by chance or good fortune, it may be some years before the true result is known. Having completed 20 items TATATM is targeting a further 30 for 2009. It is not just 30 pictures; they will include information that advises Internet users that TATATM has amongst its collection items that place the museum on a ‘must visit’ list while in Taranaki. Both of these examples highlight the need for regular communication with the contributors and the need to set achievable goals for the volume of data and images that volunteer-run museums are expected to provide to such a project. 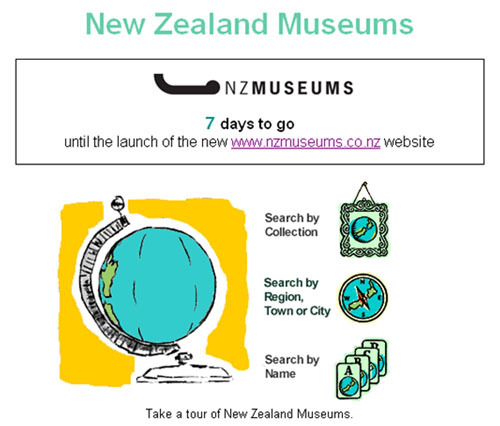 The redeveloped NZMuseums Web site launched in September 2008. Access to the collections management system for contributors to add further content was launched in December 2008. Currently 385 Museum have profile pages on the site giving the main details about their institution: where they are, how to contact them, a summary of their collections and a selection of general images of the museum building and/or its galleries. Of these, 53 have so far uploaded or entered on to the Web site, catalogue records and associated images. Contributors were encouraged to always include an image of the object, and as a result 99% of the object records have at least one associated image, and 4% have two or more images. 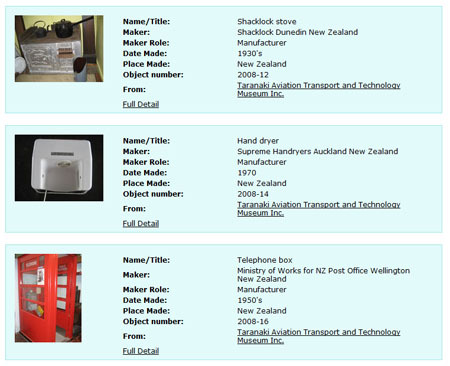 The larger museums in New Zealand all have existing collections management systems, and most have selections of their collection available on-line. This has made it much easier for these museums to contribute to NZMuseums and is reflected by the proportion of larger museums on the site. Of the 53 current contributors, 33 can be classed as small museums. In the project planning, National Services Te Paerangi aimed to get 20 museums on board for the launch. The end result is higher than anticipated, so it is wonderful to have 33 small museums already represented, with more joining the NZMuseums community every month. The most important factor in this success has been the ongoing communication with the sector, both through the central coordination of Te Papa’s National Services Te Paerangi, and through ongoing technical support to contributors from VSL, the solution provider. Around 500 tags have so far been added to the initial 2,600 records. There have been no inappropriate tags added, and this has been very encouraging. Comments have helped discover more information about some of the objects, particularly past provenance of local history items. In the first three months the site had 13,000 visits with 100,000 page views. All pages are discoverable by search engines, and this is continuing to drive visitors to the site. Anecdotal evidence from many of the contributors points to museum visitors discovering museums they were not aware of through the new site, and that physical visitor numbers in turn are up. There were many ideas in the project plans for what could be done with the data. It was decided to concentrate first on the minimum set of features that were required for the initial launch and then add additional features gradually after this. What do small museums need to contribute to a national Web site project? What builds a strong foundation for the site? Encourage public involvement. The data available is already being enriched by enlarging the audience, helping others to discover it, and increasing the custodians’ knowledge of what they hold. Provide functionality to support the reuse of data in other projects. Work still needs to be done on support for OAI-PHM harvesting of Dublin Core metadata and the use of Creative Commons to allow the data to be automatically reused in other New Zealand digital projects. For the first time there is a national portal to collections held by the many small museums around New Zealand. The content can be organised into sets that break out of traditional museum boundaries. The foundations are in place for a site that will continue to grow despite a limited budget for both National Services Te Paerangi and the museum sector.